As the mother of two teenage daughters, I would be thrilled if either of them decided to become a teacher. I can’t think of a more important way to contribute to the community. For the past half-century, most American parents agreed with me. But this year, for the first time, the tide has turned. In PDK’s recent annual poll of American attitudes about education, a majority of parents said they don’t want their children to become teachers — the first such finding in the 50 years since the poll launched. Parents cited low pay as the reason for their reluctance. They are right: Teacher pay is too low, and the problem is especially dire in states that have failed to invest in education for the past decade. In 30 states, average teacher pay is less than the living wage for a family of four. In fact, inflation-adjusted teacher salaries have actually declined since 2010. On average, teachers earn only 60 percent of what other college-educated professionals do, and in nearly all states, mid-career teachers who are the family breadwinner are eligible for at least one public assistance program designed for low-income families. But increasing salaries is only part of what’s needed for teaching to regain its stature among parents. Dramatic changes are essential for attracting and retaining future generations of excellent teachers for our children. Education is a profession that relies heavily on talent but doesn’t invest in it. The average school district has only one recruiter for every 2,000 students. Sixty percent of districts don’t post job openings on social media. Only 6 percent have applicants teach a lesson as part of the hiring process, and two-thirds don’t even interview prospective teachers. In Finland, by contrast, one of the highest-performing countries for education, it’s easier to become a doctor or a lawyer than a teacher. Only 10 percent of applicants are admitted to teacher preparation programs, and they must do well on a variety of assessments, including an entrance exam specific to education; an interview; and a practice lesson given to actual students. Once admitted to teacher preparation, educators in Finland go through a rigorous and research-based training program. They must have a master’s degree, and their coursework to earn it focuses on developing strong pedagogical content knowledge and research skills; while earning their degree, they spend a year teaching youngsters at university-affiliated schools. And when they graduate and enter the classroom, they are given the time and autonomy to collaborate with their colleagues to improve their craft. Other locales, like Hong Kong, Singapore, and British Columbia, Canada, focus a lot of attention and resources on providing teachers with professional learning experiences that drive student learning gains. While the approaches in these locales may take different forms, all these education systems view professional learning as a central part of the teaching profession, focus intensively on improving student learning as the ultimate goal of professional learning, and establish roles for expert teachers to support professional learning. In each of these systems, professional learning involves a cycle of assessment of student learning, development of teaching practices to improve student learning, and evaluation of the impact of these practices in order to improve teaching and learning over time. This kind of intensive, personalized inquiry, research, and training is the norm in fields like medicine, but it is something American teachers don’t often receive. Still, each of these best practices do happen in fits and starts across the country. Teacher pay is competitive in some states, like Massachusetts, New Jersey, and Maryland, even after adjusting for the higher cost of living in these areas. 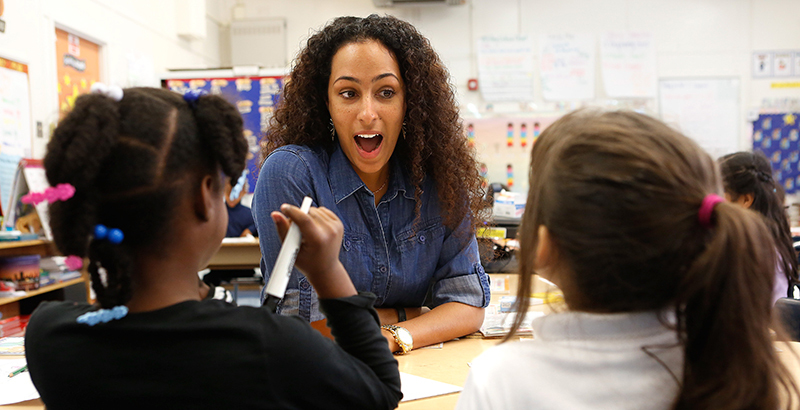 Some states and districts, spurred on by teacher shortages, have taken recruitment seriously, seeking out early hires and launching national campaigns to get educators to come work in their districts. Despite shortages across the state, district leaders in Tulsa, Oklahoma, have been beating the odds and starting the year with no vacancies. They start their recruitment process earlier than nearby districts, which research shows can bring a stronger pool of candidates, and have created a more streamlined hiring system that is easier for both administrators and applicants to navigate. The quality and focus of pre- and in-service training is also changing in many locales. Residencies and other clinically oriented programs across the country are giving teachers much more experience in the classroom before they begin teaching on their own. In these programs, rather than the more typical six to 12 weeks of student teaching, residents work with students for a full school year under the guidance of a mentor teacher. Though initially their performance is similar to that of other novice teachers, graduates of the Boston Teacher Residency, for example, go on to outperform more-experienced teachers after their third year in the classroom. And states like Louisiana and districts like Duval County in Florida have been lauded for their professional learning best practices. In both of these places, this is centered on content and student learning and takes place in professional learning communities. In some places, these programs have been integrated with a career pathways system that allows excellent, accomplished teachers to take on a leadership role and train the next generation of professionals — for example, by acting as a mentor to a resident or an instructional coach for their peers — without having to become an administrator. The PDK poll indicates an urgent need to modernize and elevate the teaching profession. Systemic change that makes better preparation, pay, training, and opportunities for advancement the norm across the country would create a teaching profession that all of us would want our sons and daughters to join. Carmel Martin is a distinguished senior fellow at the Center for American Progress.